Recognize that picture up there? Of course ya do! It was used in magazine ads when Marvel vs Capcom 3 was still in full hype mode. This artwork was made by an artist named Dave Wilkins. He currently works as a comic artist for Marvel Comics, along with doing concept art for other mediums including films and videogames. One thing you’ll notice right away is his excellent use of color and lighting. Another neat visual aspect of Mr. Wilkin’s artwork is the visible brush strokes on parts with maximum lighting and shadows. I’m a big fan of techniques like this as it shows the processes that the artist takes in coloring and gives a picture a sense of movement. This is especially prevalent in his concept art for Splatterhouse, as every punch, kick, and blood splatter delivered by Rick looks like someone was there and took a picture of Rick mid-asskicking. Speaking of which, you should check out the Fangoria cover he made featuring Splatterhouse. The story behind it is freaking awesome and inspirational for anyone that wants to get into the field he’s in. His main base of operations is his website, davewilkinsart.com. You can also catch his gallery over at deviantART as well. Hit the jump for a taste of his artwork. On display (starting after the header image): HADOKEN, Collabo with the Franchise, Deadpool, Splatterhouse Fangoria Cover, RAPH vs SHREDDER. 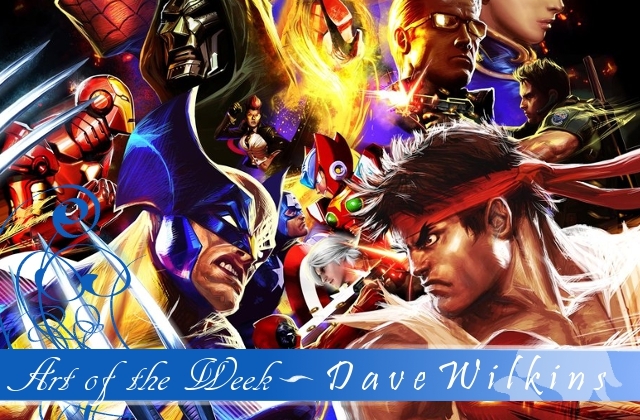 This entry was posted in Art of the Week and tagged art, concept art, dave wilkins, deapool, fangoria, marvel, marvel vs. capcom 3, mvc3, rick, splatterhouse, teenage mutant ninja turtles, tmnt, wolverine on September 2, 2011 by Steven T..